The visiting US Congressional delegation led by Senator Jeffrey Alan Merkley on Sunday underscored that the delegation came to Bangladesh to bring the attention of the United States as well as the international community on the Rohingya issue was looking forward to their successful repatriation to Myanmar. The delegation leader said he was impressed by the initiatives undertaken by the Bangladesh government under the leadership of Prime Minister Sheikh Hasina to mobilise support for the Rohingyas. The delegation expressed their gratitude towards the government of Bangladesh on the humanitarian assistance it is providing to the Rohingyas. They discussed the Rohingya issue during their meeting with Foreign Minister AH Mahmood Ali in a city hotel on Saturday evening, said the Foreign Ministry here on Sunday. Senator Richard Durbin, Congresswoman Betty McCollum, Congresswoman Jan Schakowsky, Congressman David N Cicilline, US Ambassador to Bangladesh Marcia Bernicat and other officials of the US Embassy in Dhaka were present. The delegation visited the Rohingya Camp in Cox's Bazar earlier in the day. State Minister for Foreign Affairs Md Shahriar Alam, the Chair of Parliamentary Standing Committee on Foreign Affairs Dr Dipu Moni, MP, and other members of the Committee and senior officials of the government were present. 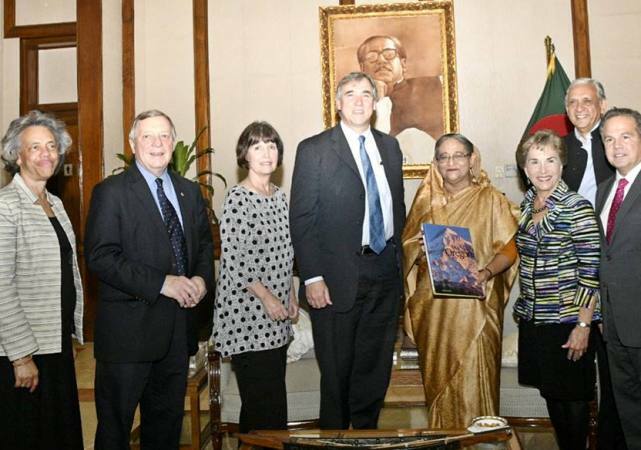 The Foreign Minister welcomed the US delegation to their maiden visit to Bangladesh. He profusely thanked Senator Merkley for the "very strong" political support from the US President, the Congress, US Department of State and American people on the Rohingya issue. He also deeply appreciated their visit to Cox's Bazar to have firsthand experience on the gravity and seriousness of the situation. He also expressed his hope to sign an agreement on repatriation of Rohingyas during his forthcoming visit to Myanmar later this week.